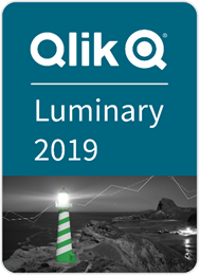 Adrian Parker of Differentia Consulting has been awarded the title of Qlik Luminary 2019. Awarded for the fourth time whilst in his role. The Qlik Luminary Program brings together the best and brightest customers, partners and enthusiasts in the Qlik ecosystem. With deep drive, passion and expertise, Qlik Luminaries champion the vision of turning data into insights that lead to transformative discoveries. Becoming a Qlik Luminary isn’t just about better business practices. It’s about creating a better world—one in which data is harnessed to create beneficial changes, not just for their own organizations, but for others, too. Qlik Luminaries are constantly pushing the envelope, finding new and innovative ways to use, deploy and talk about Qlik solutions.